Normally about this time of year we make a big batch of cookies for friends, neighbors, holiday parties and of course Santa. This year though we made cookies a few weeks ago for a cookie exchange. So I was on the lookout for something a little different to make. 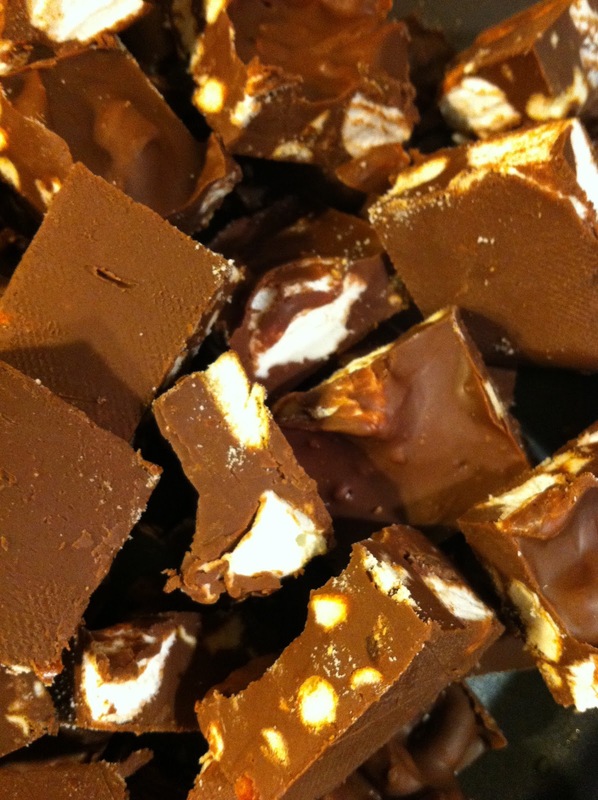 I saw a this fun recipes from Bellissima Kids for chocolate bark and was surprised to read how easy it was to make. I figured we would give it a shot really. It seemed to me when you are covering a lot of stuff in chocolate it is kind of hard to go wrong. I started by giving The Bee and The Bean each a ziploc bag of pretzels to smash. They had a blast crunching up the pretzels both with their hands and with rolling pins. While they were smashing, I melted a bag of chocolate chips in a double boiler on the stove. I simultaneously melted a 1/2 cup of peanut butter in the microwave for 30 seconds. Then poured the melted peanut butter into the chocolate and stirred the pretzels and some chopped up marshmallows into the mix. The whole mix went right onto a cookie sheet covered in wax paper. I smoothed it out into a somewhat even layer and then let it cool in the fridge for an hour. After it had cooled I chopped it into squares and if I don't eat them all I am going to put them into small takeout cartons for gifts. We also made a few other types of chocolates in the same way, one with crushed candy canes, one with dried cranberries and one with pretzels and white chocolate!